In 1864 Vellore was at that time a small hamlet consisting of a school, a town hall, a general store, a post office, a blacksmith shop, a wagon maker’s shop and half-dozen residential dwellings. It was suggested that the name Vellore be adopted being a city in southern India (near the Palar River) were the British Duke of Wellington’s army had been victorious in a recent battle. Although the community was small in size, participation in local interest groups was strong and many were established in the hamlet. The Vellore Literary Society (1898), the Vellore Junior Farmers and Junior Institute Club (1930), the Vellore Band (1889) and the Vellore Women’s Institute (1915) were some of these organized clubs and groups. 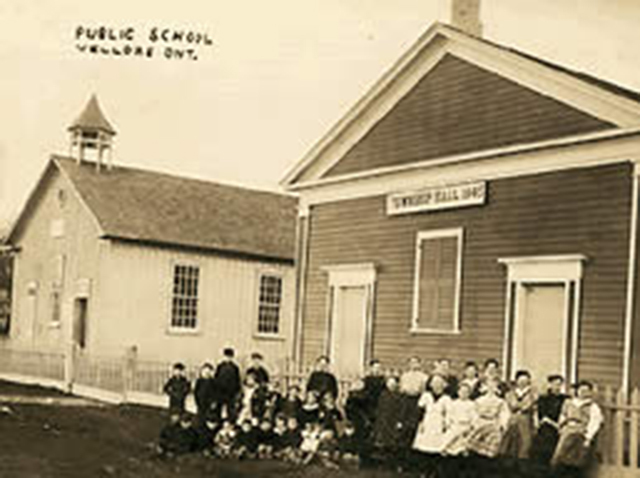 In 1837, a half-acre parcel of land was donated and secured for a schoolhouse. The first school built at Vellore was a log structure 16×20 feet in size. The students at this time sat on wooden benches and a single fireplace was the building’s only source of heat. A teacher at Vellore School during this early period was Alexander Muir who wrote the song Maple Leaf Forever, considered by some Canada’s national anthem until O Canada was officially given the title in 1975. In 1868, the existing school was constructed to accommodate the rising enrollment. It was built at a cost of $1200 with the financial assistance of the (former) Township of Vaughan. This structure housed the municipality’s original township hall built in the hamlet of Vellore in 1845. In 1919, after World War 1, Vellore Township Hall became a memorial to the local men killed in the War; and a plaque to commemorate those who died was placed on the new brick façade featuring classical columns at the front. The building was used for local municipal council meetings until 1943 when Council Chambers moved to their new offices in the community of Maple. In 1990, the building underwent extensive renovations.